If you are looking for a clarinet picture, here is a short collection of instructional and fun shots. 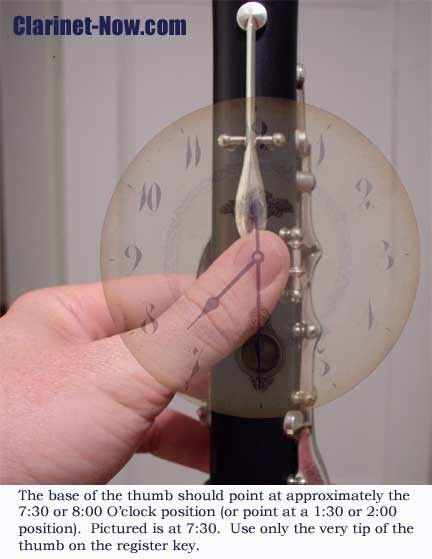 Note the position of the left hand thumb as compared to this wall clock. Note the correct height of the clarinet fingers here. Note the correct and incorrect ways to use the right hand pinky below. 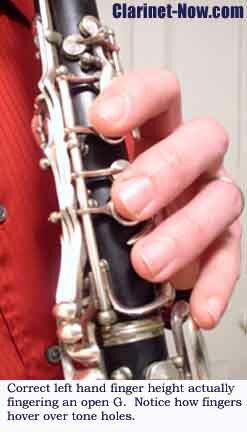 In the clarinet image below, notice the difference between the arch of the right hand fingers over the lower joint ring-rod. Make sure you do not rest your fingers on the ring-rod. Remember, to see more clarinet photos on hand position, click on any of the above shots to get a full lesson on hand position. For Clarinet Parents, this next photo is especially important. 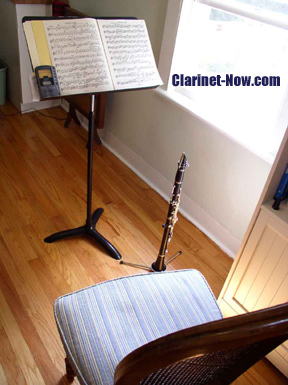 Clarinet parents, this picture is really important for your aspiring clarinetist, make sure they have a quiet, non-distracting space to practice clarinet. So, yes, banning cell-phones, computers, ipods, TVs and siblings for their practice time is important. Focusing on clarinet practice is important. Anyway, a comfortable chair and a sturdy music stand are musts in encouraging clarinet practicing. Parents, for more tips on how to improve your clarinetists’ musical experience, click on this practice space photo. Below, Clarinet on a peg.